Transpennine Express have introduced a ‘leaf fall season’ revised timetable valid from 24th October until 10th December. Of note is that mid-morning and lunch time trains from Middlesbrough have later departure times on Mondays to Fridays. As a result there are cross-platform connections at Thornaby from Coastline trains at 0951, 1054, 1154,1249 & 1349 giving, for example, a two hour journey from Hartlepool to Leeds instead of the previous 50 minute wait for a connection. There is no significant change in the opposite direction. One of Coastliners campaigns is for this sort of connection between Coastline & Transpennine services all day every day in both directions. The Coastal Art mural and video in the west entrance to Hartlepool railway station has won the Hartlepool Civic Society 2016 award for developments with tourist potential. 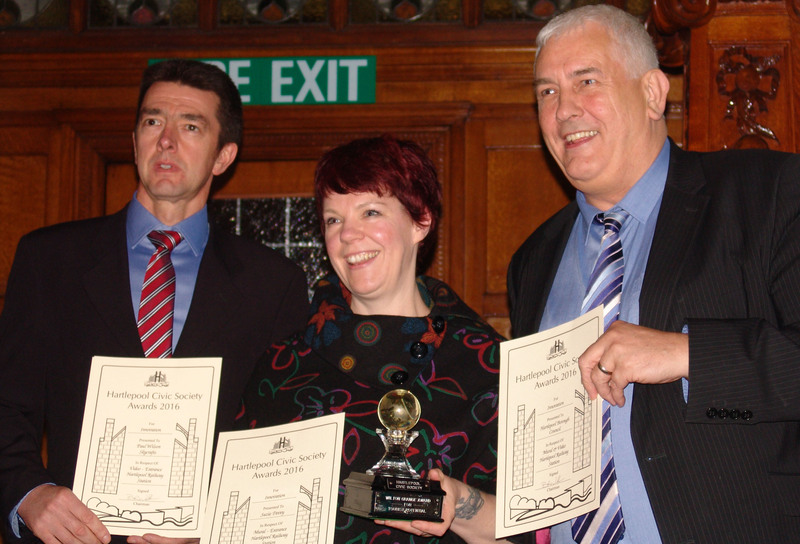 Seen in the picture, having received their awards, are (from left) Paul Wilson of Skycrafts, responsible for the drone & timelapse photography, Suzey Devey, the mural artist and Cllr. Kevin Cranny representing Hartlepool Borough Council. Durham County Council is currently consulting on the proposed site for a new coast line railway station serving Peterlee & Horden.